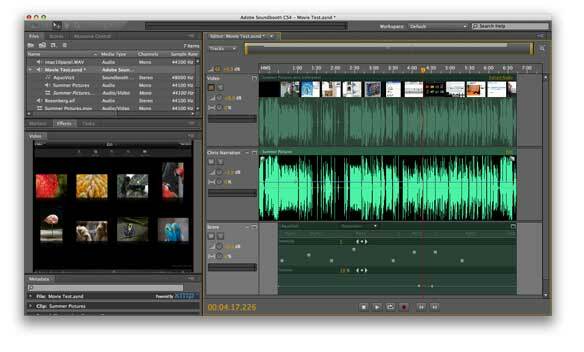 Like its predecessor, Adobe’s audio editing application, Soundbooth CS4, is a compromise. Although it includes more advanced features than the original Soundbooth ( )—multitrack editing, speech transcription, non-destructive editing, automatic volume matching between tracks, and MP3 compression—it’s still not willing to take on the role of a full-blown professional audio editor such as BIAS’s Peak ( ). Rather, it eschews features commonly found in less-expensive but more comprehensive audio editors for the sake of ease-of-use. Adobe has a clear idea of who its audience is for Soundbooth and that audience is the CS4 user who specializes in film, video, and rich media—someone without a lot of audio experience who needs greater control over sound than Premiere Pro ( ) provides, who then might wish to move a project from Premiere, through Soundbooth, and then to Flash ( ), for example. It’s set up in such a way that it’s easy to remove noise, add music and effects, and adjust volumes between speakers—a solid audio tool for the intended audience. But it’s not the best application for music and podcasting projects, as users accustomed to traditional audio editors will likely be frustrated by Soundbooth’s limitations and what they might perceive as interface restrictions and quirks, which I’ll focus on shortly. I describe the Soundbooth interface in my CS3 review and you can learn the nuts and bolts of many of Soundbooth CS4’s new features in my first look at the Soundbooth CS4 beta. In general the design remains the same—a single widow with multiple, dockable panels for editing audio and manipulating effects, markers, scores, and metadata. Soundbooth’s multi-paned interface should feel familiar to CS4 users. Multitrack editing is an important and welcome new feature. Assembling a multitrack editing environment is simple enough. As you can when working with movies and digital audio files in a program like Apple’s GarageBand ( ), you can drag a movie and audio files directly into Soundbooth’s Editor panel to add them to a multitrack project. (You’re just as welcome to navigate to your media using commands in the File menu or the Open File and Import File icons in the Files panel.) And, similar to GarageBand, the tracks cascade down the Editor panel. Each track bears the expected Mute, Solo, Volume, and Pan controls to the left side and a representation of the sound wave to the right. A master volume control is found at the top of the tracks. Standard audio tracks (as opposed to background music Score tracks) include controls on each end for adding a fade in and fade out. And you can perform keyframe volume adjustment by clicking points on a volume timeline within an audio track and then dragging that point up or down to increase or decrease volume respectively over time. To do much more than add fades, adjust volume, cut and paste entire audio tracks, and reposition tracks in the timeline, you must open the track in a separate edit panel. Once this panel is open you can then add markers and effects to the track, cut and paste portions of an audio track, and ask Soundbooth to transcribe audio to text. Many Soundbooth users will likely find the inability to perform these kinds of tasks while simultaneously viewing all other tracks confusing. For example, unless you move to this edit view you can’t modify effects you’ve added to a track. Why make users take an extra step to do this? Moreover, you can apply markers only when you’re editing an individual track, and once you’ve imposed markers, you see very little evidence of them in multitrack view. Although you can navigate through markers when viewing the entire multitrack project using the keyboard, it would be nice to be able to see the names of your markers in the timeline and Markers panel when you have the multitrack view open. Other audio editors work this way and Soundbooth should as well. In addition to multitrack editing, Soundbooth CS4 introduces speech transcription, volume matching, non-destructive editing, and MP3 compression preview. Some features work better than others. 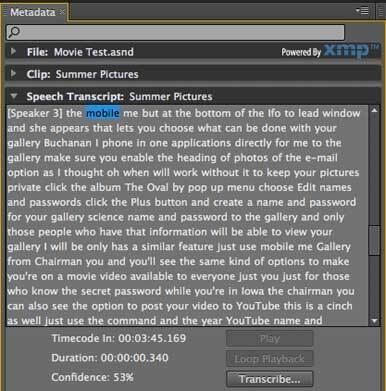 For example, speech transcription—using Soundbooth’s built-in audio-to-text engine to turn spoken words into text—isn’t very accurate, though you can correct its mistakes by keying in the words you want. But the point of this feature isn’t to produce word-accurate transcriptions of your audio, but rather to provide a guide for navigating through a long project. Once you’ve transcribed a track you can then highlight words in the transcript and easily play from that point. A Search field allows you to quickly move to a unique word. If even half the words are correct (and that’s about what you get in most cases) you can find your way. Again, regrettably, you can navigate only when viewing the transcribed track in the edit panel. Although you can see the transcription when looking at all your tracks, navigation via transcription isn’t possible. Volume matching is far more accurate. Just drag a few tracks into the Volume Correction panel and Soundbooth will attempt to match their volumes. In tests with tracks of wildly different volume levels Soundbooth did a competent job of balancing them. Non-destructive audio editing is nothing new to the audio world and it’s nice to see it in Soundbooth. In order to incorporate this feature, Adobe created the Adobe Sound Document (.asnd) format that allows you to easily undo any changes you’ve made to a file without affecting your source material. This file holds all your original assets as well as snapshots (save points you can return to at any time) you’ve imposed. The issue here is that, depending on what you’ve done to your audio, it can take Soundbooth well over a minute or more to save a file—and subsequent saves after an extensive edit aren’t much faster. For example, on my 2.66GHz Dual-Core Mac Pro, it took Soundbooth 1 minute and 22 seconds to save an 11-minute multitrack project containing two tracks to which I’d applied volume matching, noise reduction, and a single effect. True, this new format enhances interoperability between Soundbooth and other CS4 applications—allowing roundtrip editing in Flash, Premiere, and After Effects ( )—but that may not compensate for the sting of waiting minutes for a project with extensive edits to save. MP3 compression preview is a feature similar to one found in Ambrosia Software’s WireTap Studio ( ), where you can listen to how a file will sound when encoded as an MP3 file at a particular bitrate. It works well but Adobe has hidden it too much for my taste. It would be more helpful if this feature were available directly from a menu or panel rather than buried in a window that appears only after you’ve chosen MP3 from a Format pop-up menu while invoking the Save As command. Despite my concerns about the implementation of some of its new features—the inability to do much with your audio outside the edit view, the lack of named markers in multitrack edit view, inaccurate speech transcription, and the time it takes to save some files—I believe that Soundbooth CS4 mostly addresses the needs of its intended audience. It contains the features these users most need and is presented in a way that will be familiar to those working with other CS4 applications. So, as part of CS4, Soundbooth makes sense. As a separate application for those looking for a powerful and complete audio editor, not so much.